Sunday 7th December, 12 noon – 4.30 pm (approx.) HADAS Christmas Party. Buffet lunch. Tuesday 13th January, 8pm. Late Roman Fortifications in Northern France and their Social Implications. Lecture by James Bromwich. All the above events, unless otherwise stated, will be held at Stephens House & Gardens (formerly Avenue House), 17 East End Road, Finchley N3 3QE, starting at 8pm, with tea/coffee and biscuits afterwards. Non-members are welcome (£1.00). Buses 82, 125, 143, 326 and 460 pass nearby. Finchley Central Station (Northern Line) is a short walk away. A reminder that the closing date for bookings and payment of the deposit of £100 is 15th December. We have sufficient people for the trip to go ahead, but it would be nice to have a few more. At this time, we have booked all the rooms in the hotel, but we need to confirm by the end of December how many we actually require. This latest HADAS book is the excavation report and story of a dig by HADAS in 1973/74 at Church Terrace Hendon. The book is free to members, so that if you haven’t collected your copy you can do so at The Christmas party. Including postage and packing the book costs about £5 per copy to post. If you can’t collect your copy at the Christmas party, please tell us by email or letter if you want us to post it to you. When did the first humans arrive in Britain? Where did they come from? And what did they look like? These were the questions addressed by Dr. Nick Ashton a curator at the British Museum specializing in Lower and Middle Palaeolithic archaeology at the October 2014 HADAS lecture. Nick drew on the work of the Ancient Human Occupation of Britain (AHOB) project of which he is the Deputy Director. http://www.ahobproject.org/ The project began in 2001 involving a collaboration of scientists from many disciplines. Until this project the evidence pointed to the first human habitation of Britain occurring some 500,000 years ago. This new project based on finds mainly from the eroding Norfolk and Suffolk coastline, pushes that timeline back to near one million years ago for the first humans roaming Britain. Evidence from the presence of simple stone tool technologies for humans in southern Europe can be found from 1.5 million years ago. Fragmentary human fossils dating to just over one million years old have been found in southern Spain at Orce and Atapuerca – these have been assigned to the species Homo antecessor, or ‘Pioneer man’. So what is the evidence for the first humans in Britain? Eroding cliffs on the coasts of Norfolk and Suffolk have exposed thousands of fossils of mammals such as mammoth, rhino and hippo. The bones have been recovered by fossil collectors over the past 250 years from the black muds, sands and gravels of the Cromer Forest-bed. The AHOB project in excavations at Pakefield in Suffolk and Happisburgh in Norfolk continued to make such finds but also discovered flint tools that chart the presence of early humans over 800,000 years ago, making it the earliest evidence for people in northern Europe. What was the climate like at this time? There are a number of techniques for understanding environmental conditions in the pre-historic past. The changing ratio of two oxygen isotopes – one accumulating in ice, the other in water evaporating from the oceans – shows a saw tooth pattern through time with sequential cold and warm climatic phases; glacial and inter glacial periods. Biostratigraphy focuses on correlating and assigning relative ages of rock strata by using the fossil assemblages contained within them. The study of animal and plant remains gives a good indication of the temperature ranges at the time. Drawing on this evidence and others Nick suggested that the Pakefield finds of 700,000 years ago occurred in a noticeably warmer climate than today – or ‘Costa del Cromer’ Mediterranean type conditions. Happisburgh conditions, over 800,000 years ago were more akin to those of southern Scandinavia. In May 2013 following a storm a large area of exposed mud was found on the beach at Happisburgh. On the beach that day was Dr. Martin Bates who had undertaken work on human footprints at Borth near Aberystwyth in Wales. He recognised that the impressions in the mud were human footprints – at over 800,000 years old they are the oldest footprints in the world found outside Africa. How were early humans in Britain adapted to the changing climate? There is still much debate on this topic. Dr. Nick Ashton suggests that in the period over 500,000 years ago human occupation of Britain was sporadic, based around scavenging with humans having functional body hair for warmth, no clothing, no fires and no shelters. By contrast in the period after 500,000 years ago occupation was sustained, with hunting, clothing, shelters and use of fires evident. The AHOB project has considerably increased our knowledge of the human occupation of Britain. There is scope for much further study of the pre glacial deposits along the Norfolk and Suffolk coasts which could reveal much more. Attention is also moving to offshore sites in Norfolk which diving teams will explore over the next few years – perhaps opening a new chapter in the story of humans in Britain. Last month we were sad to report the death of Jack Newbury just one day before his 95th birthday. A number of HADAS members were among the many mourners at his funeral on November 5th. Jack’s importance within HADAS was not just as the printer of our Newsletter for so many years, but as a constant supporter of the outings and events organized by his wife, Dorothy, almost since the time she joined HADAS in mid-1972 (along with their children, Marion and Christopher, in HADAS’s “Under-18” category ). Jack was born in Bloomsbury on October 19th 1919 into a family of printers, but his connections with what is now Barnet were strong: in the early ‘30s the family moved, as one of the first householders, to John Laing’s new Golders Green Estate. Having served a proper (paid for!) apprenticeship at the Dispatch Press in Cricklewood, publishers of the Golders Green Gazette, he worked as a qualified journeyman printer until being called up in 1941. Before he was sent overseas he and Dorothy married in 1942 (their 70th wedding anniversary celebrations in 2012 included congratulations from the Queen). Demobbed in 1947, Jack set up as an independent printer in Cricklewood. Next his Hillary Press moved to a small factory/stable in West Hendon, then finally they purchased the printing works of the Hendon Times in Church Rd, now a repository of a marvellous collection of old printing machines as well as more up-to-date equipment. Jack was a very active member of Rotary and his knowledge – and singing – of old music hall songs was legendary. He could appear brusque and acerbic, but in fact was always incredibly helpful to HADAS and to many, many people. His delightful booklet, “The Life & Times of J.V.Newbury. Esquire”, up-dated this year, was given out at the funeral and those who weren’t there can get a copy from Christopher Newbury at Hillary Press, telephone 020 8203 4508. Some people have asked about donations in Jack’s memory: these can be made on-line at: http://memorygiving.com/jacknewbury. The year after I joined HADAS (1974) I experienced one of its Long Weekends: a three day trip to Hadrian’s Wall. We were based at Twice Brewed and I shared with Ann Trewick. I soon discovered that Ann was an enthusiastic and regular digger who had taken part in several HADAS excavations. She was always essentially a hands-on archaeologist: active, energetic, and practical. Even after she moved her home to Felixstowe she maintained her contact with us and would invariably meet us when we visited sites in that area. The great excavations at Sutton Hoo kept her busy and gave her enormous pleasure. We took a HADAS group there on at least three occasions. Ann and I continued to exchange “new reviews” each Christmas. I shall certainly miss her. Editor’s note: Ann was elected on to the HADAS Committee at the AGM held in May 1972 and remained on for many years. After visiting Tower Hill to view the poppies, Jo and I made our way to the Guildhall and visited the Art Gallery situated on the east side of the courtyard area. Our reason was to look at an Exhibition about Tower Bridge, which is celebrating 120 years since its “opening” in 1894. What an interesting exhibition it turned out to be. Quite a few paintings showing the bridge, including the opening ceremony, but most interesting were a number of photographs taken during construction (in 1892/3). There are also some of the bridge designs that were rejected. We also visited the Roman amphitheatre in the basement. The exhibition (and amphitheatre) is free of charge and runs until 5th January, 2015. For background and a location map on this dig please refer to the July 2013 Newsletter, No. 508 and Oct 2013, No. 511. The school lies on the east side of High Road (Great North Road), East Finchley, grid ref TQ 27002/89970, the site code is MPS14. After unexpectedly discovering the buried air-raid shelter in the playing field of the school in 2013, we decided to return in August this year to further investigate the main entrance of the shelter of the High Road and to check out some earthworks in the NW corner of the playing field. Using a 1946 RAF aerial photo which shows the shelter intact, we plotted and triangulated more or less where the main entrance passage should be. We then carried-out a resistivity survey over the likely area using baselines from the 2013 dig. This showed high resistivity of the north-south shelter passageway (which we knew of) adjacent to the High Road, a passageway at leading at right-angle from this (which we suspected from slight earthworks) and a wider patch of high resistivity just to the north where we thought the entrance and reception was. Whilst the above surveys were being done we decided to machine-out a section of the NW corner of the shelter. While we have used machines on digs before, this is (I think) the first time we have deliberately hired a mini-digger for the purpose. The result of this was a 2.00m x 3.00m trench exposing both sides of shelter passageway running E-W, this would have joined the N-S passageway in this corner (see map), we did not see evidence of a ‘side’ entrance in this corner (although we suspected one from the aerial photo), but space was a bit limited for further investigation with nearby fencing and trees so we had to leave it at that. The walls (1.40m apart) were similar to those found in the 2013 excavations with concrete shuttered construction, the roof had again been demolished leaving the cut reinforcement rods exposed, the top of the walls are at around 87.30 OD. Some investigation was done to try and find stencilling as seen in previous sections but none was seen. The finds from trench 8 were fairly mixed and topsoil in nature including iron fittings, some Refined Whiteware (china) and earthenware pottery, the glass included a complete milk bottle marked ‘LWD’ (⅓ pint) with some further bottle glass and window glass. Animal bone had samples of a femur-head from a possible pheasant and a fragment of sheep/deer long bone with evidence of cut marks. When the surveys were in, a trench of 4.00m x 1.00m (orientated N-S) was placed over an area which (we hoped!) took in an underground passageway, the main entrance way from the High Road and possibly some stairs/reception room into the shelter complex. Once again the mini-digger was deployed, topsoil  of approx 35-40cm lay over a mixed rubble context of approx 36cm . Below the rubble at the southern end of the trench the top of a further shelter wall was encountered running E-W, this was a northern section of passageway wall (see map) as predicted, (the southern section was unexcavated, but assumed). This wall levelled in at 87.39m OD which fits fairly well with levels from the top other shelter walls around the site. At 3.00m further north in trench 9 another wall was revealed; again this ran in an E-W direction. The difference was that this wall was brick built, red and yellow bricks laid in English Bond style being 23cm wide. This wall lined-up with the main entrance of the shelter as seen on the 1946 photo and resistivity survey, it also lined-up with a convenient entrance size hole in the present day tree/bush line boundary beside the High Road. However, one wall does not an entrance-way make, so a 2.50m trench extension was made northwards, lo and behold a similar brick built wall was found 1.40m north of the original. These had been demolished to a level of 87.21m OD (approx 64cm below turf-line). Between the walls was a stiff re-deposited clay, a small sondage pit was dug beside the brick walls 47cm in depth revealing at least 10 brick courses, plus approx 50cm of auguring beyond that showed no signs of foundation or flooring. 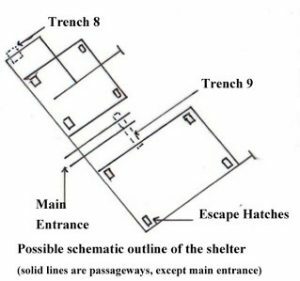 But it seems there could have been steps leading down into the shelter as a Civil Defence Emergency Committee minute (12th August 1941) mentions – “Deep trench shelters: entrances changed from ramps to steps, approved”. So we’re fairly sure we have the line of the main entrance way leading down into the complex. On the aerial photograph there appears to be a roof (concrete ?) of a shelter entrance approx 6.00m long E-W and 1.70m wide adjacent to the southern side of the entrance stairs. This was situated in the middle of the shelter system. Unfortunately we could not find any evidence for this, the superstructure would have been demolished and we saw no foundation for it, only the re-deposited clay as mentioned above. There is a slight possibility that it was using the walls of the main entrance wall and the trench passageway (to the south) as the foundation, some of the reinforced concrete iron-rodding indicated a possible dual use, but this was difficult to prove. Finds from trench 9 (the overlying contexts 001 and 002), are similar to trench 8 and indeed from the rest of the site including assorted metal objects, pottery, glass and some clay-pipe stem. There were two coins, one George VI sixpence, (1944?) and one George V penny (1935?). A full list of finds lies with the archive. Targeted resistivity/earthwork surveys and excavation has revealed the various passageways from one end of the complex to the other. The main brick-built entrance way from the High Road has been found in line with photographic and survey evidence, although the doorway into the system proved more elusive. Experience was gained on the hiring and use of digging machinery on-site. Continuing research by Roger Chapman through various Civil Defence committees show that through late 1939 and into 1940 there was a continuing problem with flooding and water ingress into the shelter. Several ideas were explored including automatic water-pumps, lining and waterproofing the walls, none of the solutions proposed seem to be fully satisfactory. A further problem was damage caused to equipment in the trench shelters, the Town Clerk gave instructions for fencing to be erected, with the necessary gates and locks around the shelter. 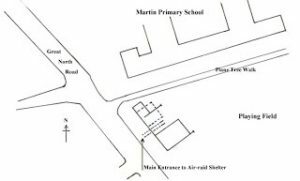 In August 1940 Mr C J Mathews on behalf of several residents in Chandos Road submitted an application to construct a gateway in the fence at the rear of his garden giving access to Martin School playground in order that residents in question might use the school shelters. Committee gave it very close consideration but refused the application. MARTIN SCHOOL: Roger Chapman, Tristan Green, Helen Morrison. HADAS members on-site and those who helped process the finds. Roger Chapman: ongoing research of air-raid structures through the Borough of Finchley Council minutes. The whole Kent trip was delightful but readers will be unsurprised to learn that this trip along part of the Romney, Hythe and Dymchurch Railway was a particular highlight for me! Originally opened in July 1927 by wealthy motor racing enthusiast Captain John E P Howey, this 15-inch gauge line runs for 13 and a half miles from Hythe to Dungeness (www.rhdr.org.uk) ; our 35-minute trip covered the southern-most five miles from Dungeness – and all around the terminus loop there – to the centre of operations (including museum – with replica wartime armoured train – , shop and engine/carriage sheds and workshops) at New Romney. A good preview was the view from the top of ‘Lydia’s Lighthouse’ showing the huge expanse of shingle and holiday homes, including several still built around late Victorian and Edwardian wooden-bodied standard-gauge railway carriages that have been there since the 1920s/30s. Even in five miles, the scenery is constantly changing – from open shingle beaches and the sea, to the Dungeness nuclear power station several of us had visited an hour or so earlier, to suburban streets (and level crossings) and back gardens, to open green fields and woods. Rather to my surprise, the railway was a hive of activity, even this early in the season; we saw no less than three steam engines in operation (from a fleet of eleven), plus one of two modern diesel locos. And to appeal to the trainspotter in me, they were all consecutively numbered! No 10 ‘Dr Syn’ Named after a fictional local Parson and smuggler, and another Yorkshire product of 1931, but recently modified with taller boiler fittings to better match the height of the cab. No 11 ‘Black Prince’ Built by German firm Krupp in 1937, and formerly operated on a park railway in Cologne (where it was known as ‘Fleissig Lieschen’ – roughly translated as ‘Busy Lizzie’, being imported to the UK in 1976. No 12 ‘John Southland’ (the diesel) Built by TMA Engineering of Birmingham in 1983. One of two purchased for working Kent County Council schools traffic from New Romney to Burmarsh road, some four-and-a half miles away; we got to New Romney just in time to see the daily departure. And now I really must get back and do the rest of the line! century (although there is apparently evidence of an older 8th century structure). The church is full of unusual architectural features. The stone, which is surrounded by a probably later tiled floor, is said to represent a double-handed sword with four thick and four thin sized chevron shapes coming out on either side of the blade. They are said to possibly represent rays of light (see Kent Archaeological web site: http://www.kentarchaeology.org.uk/Research/Libr/MIs/MIsOldRomney/01.htm). It is most likely dated to the 13th century although other authorities suspect it is from the 8th century. An alternative view from British History (Volume 8) online is that it not a sword but a Christian cross. This kind of cross is referred to as an archiepiscopal cross. It is used to signify an Archbishop as the name implies, but who knows what the chevrons mean! It is so well preserved as to cast doubt about its authenticity and it is unlikely to have been in its present position since it was laid. The Norman family that owned the advowson of the church in the late 13th century were the Fitz Bernard’s and there is no record of them having been buried in the church. Can anybody throw any more light on this mysterious and intriguing grave stone? Jim Nelhams adds – Perhaps the strangest thing about St Clements is the colour scheme. A film was made based on the exploits of Dr Syn. 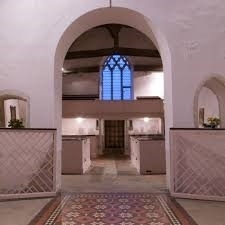 The film company wanted to use St Clements, and requested that they be allowed to paint the walls and pew in a pale pink colour, promising to restore the original colours after filming. In fact, the parishioners liked the new décor and requested that it be left. After our busy day around Dungeness, Wednesday included a visit to Sandwich (at lunchtime) and only three other scheduled visits. I have not lived in this corner of South East Kent since 1966 but it still feels very much like home to me. The Roman Painted House, mid 2nd C AD is contemporary with The East Wear Bay Roman Villa at Folkestone which members may recall our society visited two years ago. I grew up in a house just opposite the site of the latter. What you can’t win is a connection to a very special place and the Roman Painted House is just that for me, it brings the East Wear Bay Villa to life and vice versa. Substantially excavated in 1971 by Brian Philp, of the Kent Archaeological Rescue Unit who runs the museum in his retirement today, the construction of the climate controlled cover building was largely paid for by donations, following an appeal to the public, and opened in 1976. Past visits I have led with amateur archaeologist friends have had the benefit of a talk from a professional guide but this time it was given by an enthusiastic volunteer. Of course human beings seldom get things absolutely right, but it did help to highlight the history even is some of the facts were a little askew. The remains of the first smaller Painted House, built mid-2nd C AD probably in the time of Classis Britannica has 3 extant rooms, some with painted walls. This was succeeded by a much larger house, perhaps early 3rd C AD with underfloor and wall heating from furnaces at the centre of one side of each room. The wall paintings were of the highest art form, almost 3D and appear, in the main, to be dedicated to Bacchus, God of Wine, which may give some idea of the use of the building! Possibly due to increasing hostile incursions it is conjectured that the Roman Army demolished the much smaller Classis Britannica defences, around 276AD, and built the massive Dubris Saxon Shore Fort across a previously civilian settlement. This led to the demolition of the upper section of the Roman Painted House and a defensive wall being constructed through rooms 2 and 3. The rest of the building was buried beneath a rubble and clay seal which allowed the survival of the walls, flooring and murals. Over 2000 plaster fragments were found on site and preserved. Apart from the Painted House exhibition, the building is a treasure trove of information on Roman Dover with information boards and artefacts excavated by the Kent Archaeology Rescue Unit. I particularly liked the Bronze hand holding an orb and eagle found in 1970 locally, perhaps originally the top of some form of standard or similar. At the lower level, tucked away in a corner, there is an interesting medieval burial in a lead-lined coffin found in nearby St Martins le Grand in 1974. It bears a little message “placed on view by public request”. Well done Mr Philp and all his unknown helpers, for giving this exhibit space and keeping the little treasure that is The Roman Painted House open to the public. The group’s exploration of Kent continued with a visit to Walmer Castle and Gardens. Situated near to Deal Castle, it overlooks the English Channel and was built during the reign of Henry VIII. It was originally built as part of a chain of coastal artillery defences and provided state of the art means for warding off attacks from sea-borne invaders. An audio guided walk is provided at reception and is very informative and well produced. Much of the castle’s original military purpose has become redundant over the years, and it has been made comfortable as the official home of the Lord Warden of the Cinque Ports. Many of the rooms used by the Duke of Wellington (when he was the Warden) are still furnished as in his time, and contain artefacts such as a pair of his boots (!) and the armchair in which he died. The Queen Mother was also a Warden as was Sir Winston Churchill. The Queen Mother was associated with the beautiful gardens in which the visitor can walk and admire. As with many English Heritage properties, a cosy café with outside seating is available as is a well-stocked gift shop. On to Sandwich, the third of the five Cinque (pronounced ‘sink’) Ports we visited. My old ‘Pevsner’ (actually by John Newman, and recently fully revised) says: “Sandwich could make a bid for the completest medieval town in England. A walk round it yields many pleasures . . . [but it is not] easy to find a rational route through the town.” I agree with the last observation, to which I would add the difficulty of avoiding the cars in the narrow streets. HADAS members explored the town separately, or in small groups, and discovered different places and buildings to admire (or take refreshment in). After looking in St Peter’s church with its charming secluded garden – where the south aisle had been until in 1661 it was destroyed by a collapsing central tower – I was led astray by the hope that St Mary’s church would be open. It was firmly locked, despite the Churches Conservation Trust notice outside. I continued beyond it and after a timber-framed house of 1592 with a satyr on its corner-bracket, and the exiguous remains of the doorway to a vanished early fourteenth-century house, found a very pleasant route back to the centre, along the Town Walls – not walls as we know them, but a raised car-free walk between an avenue of trees. I then went rapidly to the Guildhall, with its dark and evocative seventeenth century courtroom and the small museum next door. Then for a drink in the Bell Hotel and back to the coach. Some of our members found the other church of the town – dedicated, like several we came across, to St Clement – but I did not. On decanting from the coach, on the Wednesday of the 2014 Hadas long weekend (or short week), my first impression was of the overall enormity of the Richborough site. To walk round the entire fort taking in all the remaining evidence of the interior buildings from different periods of usage was quite a trek, pleasing though it was. However, I did feel it a shame that the grass on and around the earthworks had been allowed to become overgrown thus losing a lot of the definition between the trenches. I also felt the information boards could be given a facelift as they were in a quite tatty condition. Apart from those minor gripes, I found the whole site to be of great interest. The height and condition of a lot of the outer walls is almost overwhelming especially taking into account how long they have been standing. As I always feel when exploring sites from times so long ago, what varied and interesting lives the people who inhabited these places must have had. Wouldn’t it be wonderful to be able to eavesdrop on their thoughts, feelings, ideas and hopes? Although the group had a reasonable amount of time at the site, it would be good to go back in the future to spend more time drinking in the atmosphere and discovering more about the fort. We were very lucky with the weather as we were for the whole trip but even if it hadn’t been as good, it would have still really been worth the visit. Great! Richborough Roman Fort is described correctly as a Saxon Shore Fort but is several miles away from the sea. This was not always the case. In Roman times, the Isle of Thanet was really an island, separated from the mainland by a two mile wide channel called the Wantsum Channel. Using this channel, ships had a shorter and straighter way to London. The River Stour drained into the channel, providing access to Canterbury. As the Castles at Dover, Walmer and Deal were built later to defend the English Channel, so the Romans built at Richborough to defend the Wantsum Channel, and where the other end of the channel opened out into the Thames, they built a castle at Reculver. Until the 16th century, Sandwich was a thriving and prosperous sea and naval port. In fact, the name of the road where we parked our coach was “The Quay”. But the Wantsum Channel silted up, leaving the Stour to find a new way to the sea past Richborough and through Sandwich, presumably following close to the old coast line. These days, the River Wantsum starts near Reculver and drains into the Stour. Whitstable had not appeared on our original schedule. We had hoped to return to Canterbury Cathedral, but its sudden closure for the morning necessitated a rethink. So we found ourselves exploring Whitstable, a small town on the south side of the Thames Estuary between Herne Bay and the Isle of Sheppey. On the way in, we passed a Wetherspoons restaurant named The Peter Cushing. Peter, who died in 1994 was a resident of the town, and is best known for appearing in horror films, with roles including Dracula, Sherlock Holmes and Dr Who. The restaurant was previously a cinema, and retains many of the cinema fittings, décor and projection equipment. It also has toilet facilities accessible to the public. We made our way first to the small lifeboat station, there to encounter a number of other members enjoying a cup of coffee. Whitstable has an inshore lifeboat which is launched around 60 times each year. Others, aware of the reputation of Whitstable oysters, or perhaps their aphrodisiac properties, found appropriate eateries. Back in the High Street, we made our way to the town museum, like so many other places we had visited, run by volunteers but in council owned premises. For years, Whitstable and Herne Bay fishermen have been catching more than fish in their nets. Hundreds of pottery dishes, many complete and in an excellent state of preservation have been recovered from the seabed. 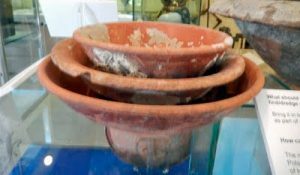 The pots were Samian ware (mid-2nd century) and were part of the cargo of at least two Roman merchant ships, which either sank or jettisoned their cargo in a storm. The pots became prized items in the homes of fishermen, and were used in Whitstable to make a special kind of Lent pudding, so the pots and the place where they were found were named Pudding Pan. When families emigrated in the 19th and 20th centuries, many took Pudding Pans with them, and so there are examples all over the world. The recipe is also displayed. The museum also has information about the Canterbury and Whitstable Railway, later known as the crab and winkle line, which claimed to be the first railway for paying passengers in the world. Robert Stephenson built a locomotive named Invicta in 1830, which is displayed in the Canterbury Heritage museum. Trains were hauled by locomotives on the level section of the line. On hilly sections, carriages were pulled by ropes attached to static steam engines. The course of the line is now a six mile public walkway. Wednesday, 7th January, 8pm. Stanmore and Harrow Historical Society, Wealdstone Baptist Church Hall, High Street, Wealdstone. “The history of Westminster Central Hall”. Talk by Mrs. B. Milne. Visitors £1. Thursday, 8th January, 10.30am. Pinner Local History Society, Village Hall, Chapel Lane Car Park, Pinner. “The history of St. Margaret’s school, Bushey”. Talk by Enid Jarvis. Visitors £2. Monday, 12th January, 3pm. Barnet Museum & Local History Society, Church House, Wood Street, Barnet (opp. Museum). “An assorted history of Singapore featuring the Mill Hill connection and the five foot way”. Talk by Rob Kayne. £2. Wednesday, 14th January, 2.30pm. Mill Hill Historical Society. Trinity Church, The Broadway, NW7. “The history of Waltham Abbey Gunpowder Mills”. Talk by David Sims. Wednesday, 14th January, 7.45pm. Hornsey Historical Society, Union Church Hall, cnr. Ferme Park Road/Weston Park, N8 9PX. “We will not fight – Hornsey’s WWI conscientious objectors”. Talk by Jennifer Bell. £3 refreshments. Thursday, 15th January, 7.30pm. Camden History Society, Camden Local Studies and Archive Centre, 2nd Floor, Holborn Library 32-38 Theabalds Rd. WC1X 8PA. “Pevsner in Hampstead and Bloomsbury”. Talk by Susie Harries, Visitors £1. Friday, 16th January, 7pm. COLAS, St Olave’s Parish Hall, Mark Lane EC3R 7NB. “The ark long before Noah”. Talk by Irving Finkel, Visitors £2. Monday, 19th January, 8pm. Enfield Society with Edmonton Hundred Historical Society, Jublee Hall,2, Parsonage Lane/ jnc Chase Side, Enfield, EN2 0AJ, “The origins of the Edmonton Hundred”. Talk by Jason Peters. Thursday, 29th January, 2.30pm. Finchley Society, Drawing Room, Avenue House (Stephens House) East End Road, N3 3QE. “The mystery of John Parr (First soldier to die in action in WWI and from Finchley)”. Talk by Mick Crick, Visitors £2. Friday, 30th January, 6.30pm. Friends of the Petrie Museum, UCL, Lecture Theatre G6, Institute of Archaeology, 31 Gordon Square, WC1. “Ancient Egyptian Mortars and Plasters, Recent analysis of Egypt’s Archaeological Wall paintings and architecture”. Talk by Alexandra Winkel. Thanks to our contributors: Roger Chapman, Mary Rawitzer, Sheila Woodward, Jim Nelhams, Bill Bass, Andy Simpson, Lydia Stanners, Ken Sutherland-Thomas, Peter Pickering, Jon Baldwin and Eric Morgan.